We were inspired to create this guide after seeing a similar (and much more beautifully designed) one that the Tampa Bay Times put out for the 2018 Medicare Advantage plan year. 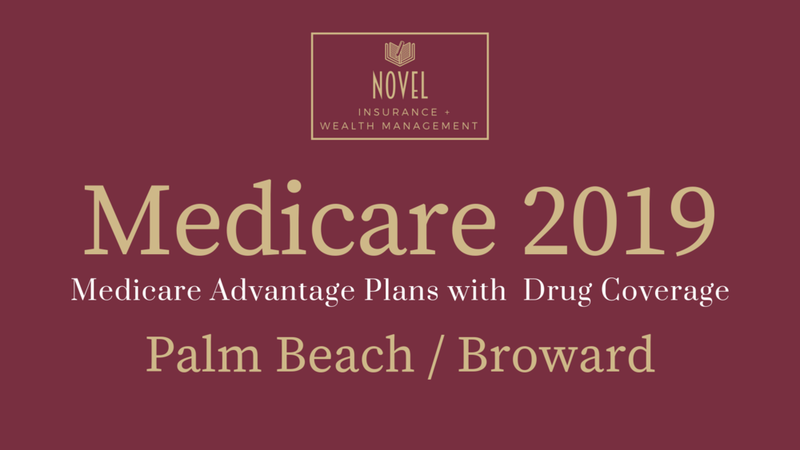 In the table below you will find a comprehensive list of the Medicare Advantage health plans with drug coverage available in the Palm Beach / Broward area for the 2019 plan year. Look below the chart for some helpful definitions and for information on what might not be included. If you want to learn more about any of these plans, give us a call, we’re happy to answer any questions you may have. HMO: Health Maintenance Organization. In these types of Medicare Advantage plans, you must receive healthcare through the plan network. If you seek treatment for anything other than emergency care out-of-network, you pay the full cost. You may need referrals to see specialists from your primary care physician, though some carriers do not require this. PPO: Preferred Provider Organization. In these types of Medicare Advantage plans, you may seek treatment within your plans network or with out-of-network physicians. You usually pay a higher co-pay to see out-of-network physicians and the plan’s out-of-pocket maximum may be higher with out-of-network physicians, as well. Referrals are not needed to see a specialist. Premium: This is the plan premium in addition to the $134 standard Medicare Part B premium. While most Medicare Advantage plans do not have an additional premium, a select few do. Part B Rebate: Also known as a Part B Reduction, this is a portion of the $134 standard Medicare Part B premium that is reduced by enrolling in that plan. It is usually seen as an increase in your social security payments, as that is where most people have their Part B premium taken from. Drug Deductible: This is the deductible that some plans require before they begin paying for prescription drugs. Some plans waive the deductible for prescription drugs in Tiers 1 and 2. Doctor Co-Pay: The fee you will pay to see your primary care physician or a specialist. Hospital Co-Pay: This is the fee you will pay when admitted into the hospital. The co-pay is charged during each individual hospital stay you may have during the year. For example, if you are in the hospital for 10 days in a plan where the hospital copay is $200 for days 1-5, you will be responsible for $1000. If you are admitted again for two days a few weeks after you are released, you would pay $400 for the additional stay. Yearly Cost (Est. ): This is the amount that CMS (Centers for Medicare and Medicaid Services) estimates the total cost associated with the plan and services you use during the calendar year. This figure does NOT include your prescription drug costs. Out-of-Pocket Cap: This is the most money you will contribute towards your treatment during a plan year. This figure does NOT include your prescription drug costs. Network Size: This is the number of physicians (primary care and specialists) that are contracted to provide service through the plan. Drug Costs (Initial Coverage): Co-pays and co-insurance for different drug tiers within the plan during the initial coverage phase. Once both the plan and insured contribute $3,820 (in 2019) towards prescription drugs, the insured then enters the coverage gap (donut hole) and pays a higher co-insurance until payments reach $5,100. At this point, the insured enters the catastrophic coverage phase, and the plan contributes 95% of further drug costs. What’s Not In This Chart? Plenty. This chart serves to give a general overview of the Medicare Advantage plans with prescription drug coverage (MAPD) in the Tampa Bay Area. Special Needs Plans for Dual Eligibles (have both Medicare and Medicaid) and those with chronic illnesses are not included. There are many co-pays that go beyond a visit to the doctor. This includes things like lab fees, urgent care, emergency care, ambulances, surgical benefits, etc. Many plans also provide you with extras that Original Medicare does not provide, such as transportation, over-the-counter allowances, gym memberships (Silver Sneakers), dental/vision/hearing benefits, some even provide in-home cleaning and meals. Medicare Advantage plans can be a great option for many Medicare beneficiaries who are looking to receive extra benefits that Original Medicare may not offer and don’t mind seeing physicians within a structured network. However, it is best to look at all of your options including Original Medicare with a Supplement (Medigap) or on its own.